Is there anything more annoying than when you have a day off work/uni so go out to do blog photos… and then it rains!?? Still, we didn’t let that stop us so please excuse the damp-ish hair in these photos. At the beginning of the year we made it our goal to have more fashion posts up on the blog as it’s something we love writing about. 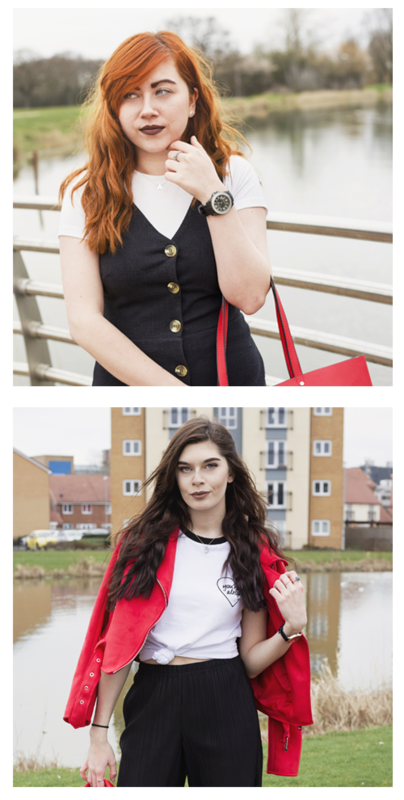 We’re now 3 months into the year and look at us, we’ve written a total of.. 3 fashion posts, better than nothing ay! I’d been wanting a jacket in this particular style for so long, so I was super grateful when Darren got me this one for Christmas. It’s a lovely suede-ish material with faux fur inside so it keeps you really warm, just a shame it’s not rain appropriate! It’s so easy to style with jeans, dresses or skirts and I love coats that are super versatile when it comes to styling. It’s a little over-sized on me, I’m not sure whether that’s the style of the coat or where I’m small it just comes up a little big but who wants a tight coat anyway? I’m not really one for wearing colour unless it’s spring/summer and i’m wearing florals, so this outfit is kind of a standard every day one! I’m never really a fan of jeans, I don’t find them to be comfortable but sometimes it’s so much easier to shove them on and pair them with a baggy tee – as you can see here. This printed tee from H&M is quickly becoming one of my faves and I haven’t stopped wearing it over the last few months. It’s a lovely soft material and I love the look it creates with a pair of ripped knee jeans. These Jamie ones aren’t the most comfortable pair I own but I love the look of them! To finish this outfit I wore my newest pair of Docs which kinda look like trainers. They really don’t look like Docs but I kinda like the fact that they are so different to what I usually wear. These are also super comfy so no blisters for me – yipee!! My gigantic bag is from Topshop and is perfect for me to fit all my stuff in, from notepads to umbrellas. To me you can’t beat a nice big Mary Poppins bag!!! This outfit is a pretty casual one which I’d normally wear to go to shopping or uni. I love this moth bitten top as the colour is quite subtle and doesn’t clash with the rest of my outfit. I don’t really wear a lot of colour so it’s nice to wear something which has a slightly pink tone but isn’t in your face! The little ripped details on the neckline and sleeves add a bit of a grungy vibe to the outfit which make it more than just a boring plain t-shirt. I’ve styled it with some cropped jeans with fishnets underneath (which I think looks cool but also keeps my legs a bit warmer!) and some Dr Martens shoes. These make a casual outfit look a little smarter and it makes a change from wearing boots like I usually do. You can’t really see my bag in these pictures, but my Lush ‘fighting animal testing’ tote bag comes everywhere with me. It’s perfect for putting all my stuff in, especially my camera, and the strap is comfortable on my shoulder. It also has an important message on it which is always good! Here’s to hoping the weather will cheer up a bit so we won’t need to wear out coats anymore! Hopefully we’ll have a few more fashion posts up soon, especially since it’ll be spring soon which is the perfect weather to go out and get blog photos. No more damp hair, yay! Great photos of both of you,you make very good models.